The Ella E52 Dual Massage Walk In Tub is the most affordable walk in tub featuring an easy-to-clean high gloss triple gel coat tub shell for excellent colour uniformity. Stainless steel frame with adjustable feet and has a 6.5 in. threshold for easy entry. ADA Compliant with components of 17 in. seat height, textured floor and a built-in grab bar. The E52 dual massage tub comes standard with eighteen 18 therapeutic air massage jets; six 6 adjustable direction hydrotherapy jets, both with pneumatic on/off push controls; and features an in-line water heater 1.5KW. Includes a five 5 piece roman faucet in chrome with hand held shower unit. The Ella E52 has soaking, air massage or dual massage options and right or left drain location. Size: 30 in. width x 52 in. length x 41 in. height. Limited Three 3 Year warranty on tub components. For more product information, please call 1.800.480.6850. E-Series Dual Massage 4 Feet 4-Inch Walk-In Whirlpool Bathtub in White The Ella E52 Dual Massage Walk In Tub is the most affordable walk in tub featuring an easy-to-clean high gloss triple gel coat tub shell for excellent colour uniformity. Stainless steel frame with adjustable feet and has a 6.5 in. threshold for easy entry. ADA Compliant with components of 17 in. seat height, textured floor and a built-in grab bar. The E52 dual massage tub comes standard with eighteen 18 therapeutic air massage jets; six 6 adjustable direction hydrotherapy jets, both with pneumatic on/off push controls; and features an in-line water heater 1.5KW. Includes a five 5 piece roman faucet in chrome with hand held shower unit. 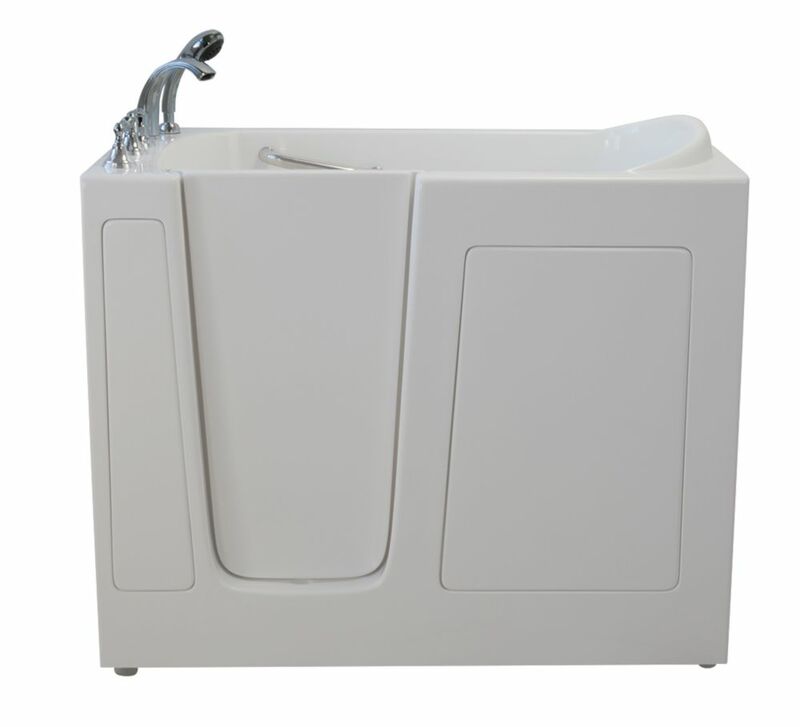 The Ella E52 has soaking, air massage or dual massage options and right or left drain location. Size: 30 in. width x 52 in. length x 41 in. height. Limited Three 3 Year warranty on tub components. For more product information, please call 1.800.480.6850.